A well-designed chair not only looks good, but offers support, provides options, maximal comfort, and feels good. At Rouillard, we have mastered the art of crafting ergonomic chairs that are mindfully designed according to the highest ergonomic standards. Our experienced team understands curves, material design, texture, posture, and workspace dynamics like no other, and we always prototype our products to ensure that our clients experience top-of-the-line quality and comfort in a workspace environment that reflects their style. Seat height should always be easily adjustable using a pneumatic adjustment lever and should allow the user to be seated in a comfortable position: feet flat on floor, thighs horizontal, and forearms at same height as work surface without having to raise shoulders. Seat width and depth should allow the user to sit comfortably while providing the user with a seat slide to further adjust the depth of the chair. The curved front ensures that the user has space between the back of the knees and the seat. Seat angle adjustments should be made proportionately and in accordance to the backrest angle for optimal comfort. Lumbar support ensures that the backrest provides comfortable support to the lower back. Quality materials that are sufficiently dense provide optimal comfort for extended sitting periods. Using quality material for coverings will allow airflow between the user and chair. It’s also recommended to use solid and sturdy materials to design the chair structure so that it provides stable support for the user. 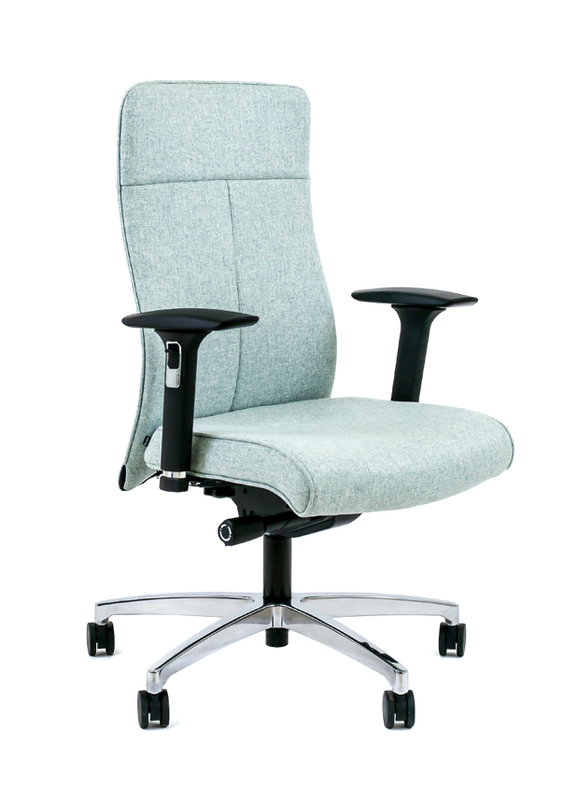 Chair swivels allow users to reach for various workspace areas without having to stretch or get up. The backrest curve should hug and flow with the natural curvature of the spine. If the backrest is not directly attached to the seat, the backrest angle and height should be adjustable. Armrest height should be adjustable to support elbows and forearms so that the user doesn’t have to lower or raise their shoulders, which should remain in a relaxed position. The armrests should also be cushioned for extra comfort, and to ensure that it won’t interfere with your workspace. Keep in mind that the width and depth of your armrests may be adjustable and they may swivel.